On 13 September 1995, Beverley Palesa Ditsie made a statement at the Beijing Women’s Conference about the importance of including lesbian rights in discussions about the empowerment and upliftment of women. She was the first openly lesbian woman to do so and it was the first time that the United Nations was addressed about considering the realities of LGBT people in the protection of human rights. 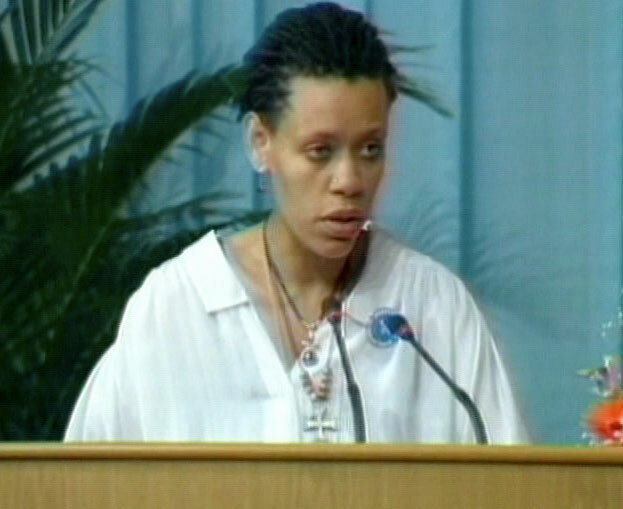 In her address, Ditsie argued that a focus on women’s rights should include the struggles of lesbian women, saying that “if the world conference on women is to address the concerns of all women, it must similarly recognise that discrimination based on sexual orientation is a violation of basic human rights”. Born in Soweto at the height of Apartheid in 1971, Ditsie was an anti-Apartheid and LGBT rights activist. She was one of the founding members of GLOW, South Africa’s first multiracial and political lesbian and gay rights group. During the drafting of South Africa’s constitution, Ditsie was at the forefront of arguing for protecting people from discrimination on the basis of sexual orientation - the first constitution in the world to do so. Her participation at the conference was a first for the United Nations and was an opportunity for Ditsie to represent and speak to the intersectionality of race, gender and sexual orientation. Despite GLOW’s mandate of non-sexism, Ditsie’s participation at the conference was not welcomed by the organisation who felt that spotlighting women was a ‘distraction’ from GLOW’s focus on LGBT issues. Ditsie went to the conference despite this, saying that “lesbians are women. Lesbian rights are women’s rights”. • Manion, Anthony. ““Beverly Ditsie”, in David Gerstner (ed.) Routledge Encyclopaedia of Queer Culture. London: Routledge Publishing, 2006.